Thanks to a waste-import ban by China, Britain has a window of opportunity to begin real progress on tackling the plastics crisis. The same may apply to some other countries. As the recycling industry and the UK media started pointing out around New Year, mountains of plastic waste will soon be piling up all over Britain, with nowhere to go. ‘Waste meltdown’ said The Sun, ‘impending crisis’ wrote The Independent. It seems to me that the best immediate response should be to simply stop selling plastic bottles. Not a complete solution but a feasible and big step in the right direction – towards a phase out of non-essential uses of plastic. (See more below). It’s an acute political problem. Politicians will seek a quick fix, and as being seen to act effectively will take precedence over anything else, so left to its own devices the UK Government(s) may well forgo the opportunity to do what is really needed, which is to start reducing the production of plastic pollution. 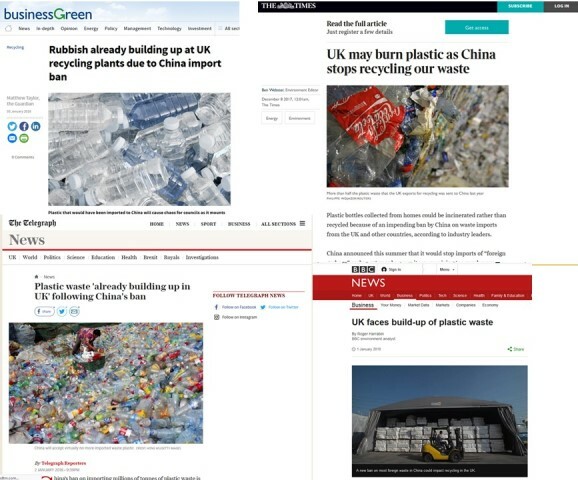 Isabel Hilton editor of China Dialogue told the BBC World Service ‘World Update’ on 5th December 2017 that “only ten percent” of the plastic waste ‘sent for recycling’ in China “is actually recyclable”, and “the rest tends to get dumped in China, it finds its way into rivers, and eventually into the sea, and that has prompted the Chinese authorities to impose a ban on several varieties of plastic”. Asked what this meant for countries exporting plastic waste to China, Hilton replied: “the rest of the world finally has to face up to its own problem”. UK Environment Minister Michael Gove has been making waves through his sudden apparent conversion to greenery. To the frustration of officials, in several Departments, he is known for liking to ‘think differently’. Here then is a Gove opportunity. He’s backed deposit returns for plastic bottles but this is in a different league. 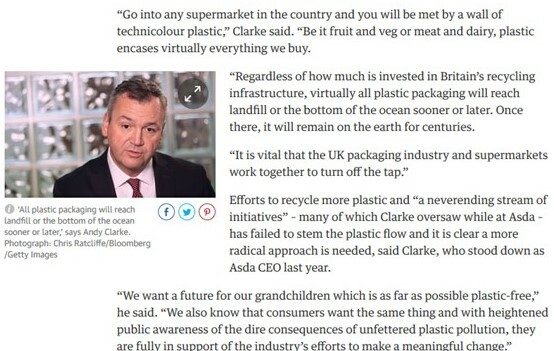 China’s decision to stop taking in much of Britain’s plastic waste and other ‘recyclate’ was signaled as long ago as July 2017 but it seems to have caught the Brexit-obssessed UK Government by surprise. As to campaigners, they might wait years for an opportunity like this, and such opportunities are very hard to create, while this one has come along thanks to China. China has implemented its decision to ban the import of 24 kinds of solid wastes – a move which is stoking fears within the UK recycling industry. The ban, which came into force on 1 January, covers eight categories of plastics waste, all unsorted mixed papers, 11 types of textile wastes not including clothing and four types of metal slag. A further ban, set for April, will set new standards limiting all imported recycled materials to a maximum contamination level of 0.5%, a percentage that is seen as impossible to achieve across the board by many in the UK’s waste industry. Around 70% of the UK’s mixed paper recyclates and 25% of plastic packaging are currently exported to China, according to WRAP, and the proposals have caused alarm within the UK waste industry. The UK’s somewhat feeble plastics recycling capacity will choke on many thousands of tonnes of plastic, mostly packaging and mostly PET bottles, which now has no outlet. Householders trying to ‘do the right thing’ and be ‘green’, may be dismayed to see mountains of plastic spilling out of depots run by the unfortunate Local Authorities tasked with collecting it and hitting recycling targets. The recycling industry is furious. 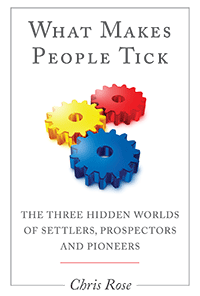 What may have seemed a long-term problem is fast becoming a very short term problem. The UK can’t scale up its recycling capacity quickly but it does not need to, and should not anyway. Instead it should start towards a phase-out, and the very top of the list, as numerous NGO campaigns have highlighted, is ‘single use plastic’, and at the top of that list in terms of scale of impact, avoid-ability, feasibility, and non-essential-ness, would be plastic bottles. Nobody needs soft drinks or water in plastic bottles. 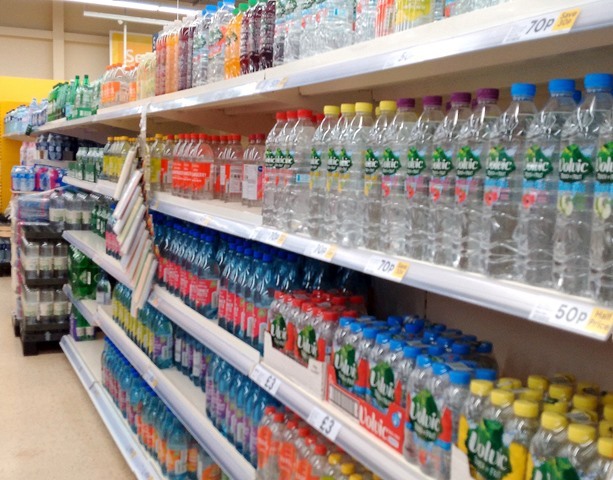 Supermarkets could clear their shelves of them like a product recall, and switch off a huge flow of plastic pollution. 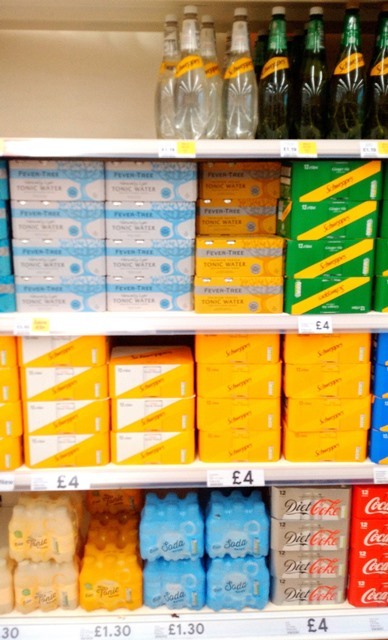 Walking down the aisles of one local supermarket yesterday I noticed that many drinks now seem to be available in cans as well as in plastic bottles, and multipacks of those cans seem to be wrapped in cardboard. So maybe the drinks industry has anticipated something like this? Britain also has more or less universal supply of excellent tap water, and thanks in no small part to campaigns, there are lots of stylish metal water bottles now available for those who may need to carry water around with them. 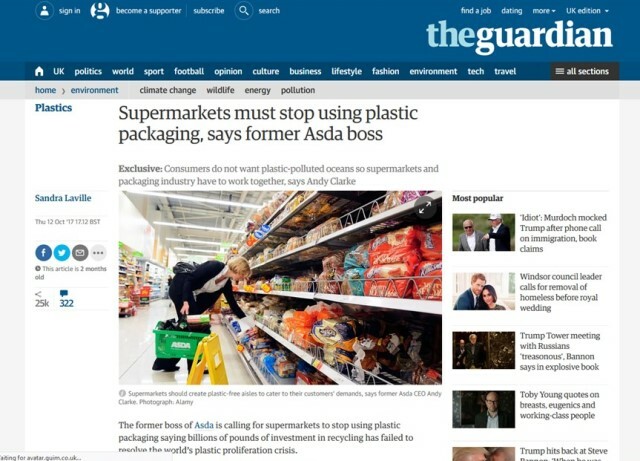 For the consumer, it would be an easy option, compared say, to avoiding plastic film wrapping on food, although as Andy Clarke, the ex-boss of ASDA told The Guardian last October, that packaging will have to go too. Clarke is right. ‘Recycling’ can’t resolve the plastics crisis, for reasons of ‘leakage’ into the environment and the effects of ‘downcycling’, such as turning PET from bottles into polyester fleeces or carpets which then in turn break up to create microplastics. It can only be useful in the context of an active phase-out. As scientist Roland Geyer has said, ‘in the long run, recycling reduces waste generation only if it reduces primary material production; otherwise, it merely delays it’. We need to get rid of plastic as a major use material. Clearing the shelves of plastic bottles is a good place to start, and this ‘waste crisis’ is an opportunity too good to waste.